We are keen to develop those who are new to the profession and also those further into their careers as teachers. We have offered various courses including ITP, OTP and NAML. 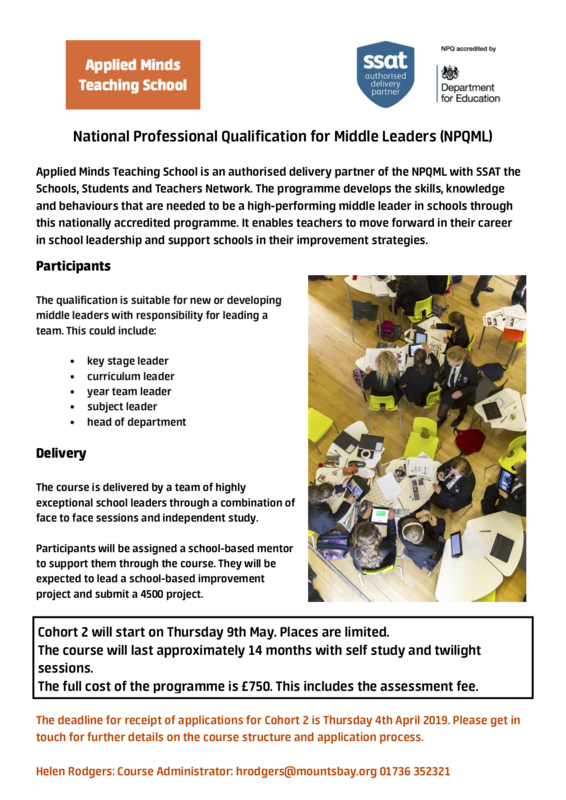 Since the NPQ suite of qualifications have been re-launched we are offering the NPQML which has been successfully running since April 2018. We are working in partnership with SSAT (the schools, students and teachers network) to deliver the programme. SSAT are committed to supporting and developing high quality middle leadership. We know how important middle leadership is to the success of any school – they are the invaluable connection between teaching in classrooms and the wider leadership vision and strategy. We also recognise that the roles of middle leaders and middle leadership cannot be narrowly defined; the terms capture such a broad range of responsibilities across school types, phases and contexts – pastoral and academic, departmental and whole-school. We embrace this diversity and complexity. 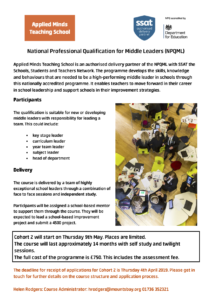 The NPQML will focus on the essentials that transcend good middle leadership in all settings, whilst allowing for contextualisation and particularisation. We are committed to ensuring our training is evidence based and draws upon the latest research. The programme develops the skills, knowledge and behaviours that are needed to be a high-performing middle leader and drive school improvement strategies and team performance. The programme is aimed at teaching staff in primary, secondary and special school settings with responsibility for leading a team. The course is delivered by a team of exceptional school leaders through a blended learning approach. Cohort 1 have given 100% overall feedback in all the modules as ‘Excellent’. We are now taking applications for our next Cohort starting on 9th May.